A robot is walking in the lobby ready to serve guests. Las Vegas — Guests and tourists are impressed by two robots who deliver coffee, send snacks and other small items to the guestrooms at Vdara Hotel in Las Vegas. 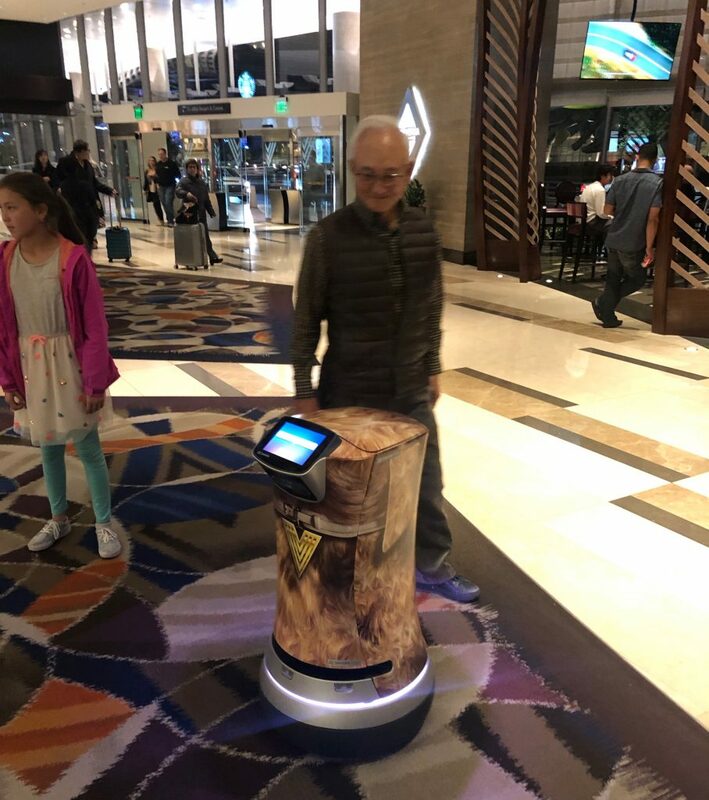 Julien Chen, a 2-year-old boy from Los Angeles with his parents and grandparents, was a little bit scared by the robot when he first saw him in the hotel lobby. However, a few minutes later, he became familiar with the unhuman servant and tried to touch him. Fett and Jett, names for the two robots employed by the hotel’s Market cafe, are actually helping hands for the human workers in the coffee. When guests need a cup of coffee, a snack, cookies or fruits, they just call from their guestrooms to the cafe and the workers would prepare them and put into the robot’s container and lock it. The robot will then “walk” to the guestrooms. When it arrives at the elevator, it can automatically see which door is open and wait till the guests are out of the elevator, then walk in, “push” the botton of the elevator number and go. When it arrives at the guestroom, it will automatically call the guest and unlock the container lid so the guest will pick up the things delivered. Once the mission completed, the robot will go back to the cafe to wait for the next guest. Jett and Fett have been working at the hotel since July this year, and have arracted attentions of the guests and tourists. They are certainly an addition to the hotel. As robots become more humanized and more capable, people can expect that they will be seen at more places and positions. The robot age is coming. 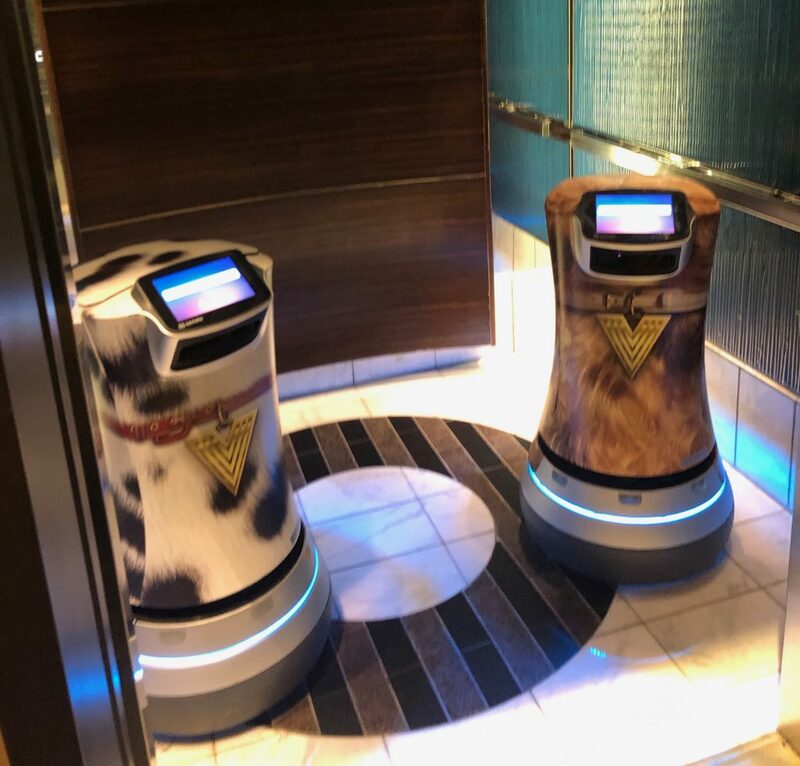 Two robots walked into the elevator ready to serve guests in different floors.